It’s already the middle of May, and summer grilling season is right around the corner. Can you think of a better way to celebrate the summer than moving your entire kitchen outdoors? Now is the perfect time to start planning a beautiful, eco-friendly outdoor kitchen. It will keep you grilling all summer long and keep the planet happy. Dream up your own perfect outdoor kitchen, and use these tips to create a perfect solar-powered paradise right in your backyard. Charcoal and gas are common fuels for cooking, but at what expense? Charcoal grills release around eleven pounds of carbon dioxide per hour of grilling, and gas grills rely on non-renewable natural gas. What’s the eco-conscious outdoor chef to do? Go solar! 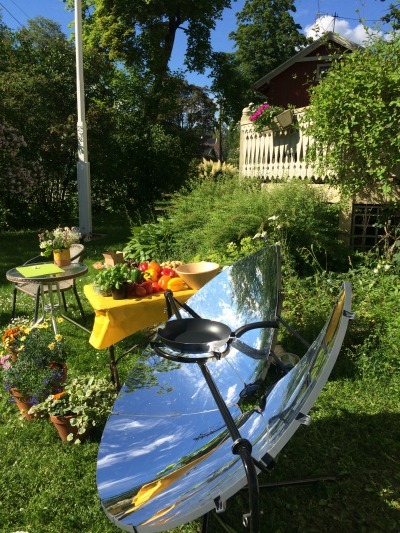 The SolSource Classic has the same cooking power as a traditional charcoal or gas stove and it is powered by the cleanest energy source available—the sun. When you’re done cooking, its unique design will add a striking visual element to your outdoor cooking space. Choose solar lights to match your solar stove. Select outdoor lights that will charge on their own all day and then light up automatically when the sun goes down. Try placing most lights and knee height and direct them downward to reduce light pollution for a better view of the stars. Stay cool without plugging in a fan by using awnings and umbrellas to create shade in your outdoor kitchen. Choose an even greener option by using potted trees to support the corners of your awning (choose one made from a sustainable fabric like bamboo or recycled parachute cloth). Just make sure that you leave a sunny spot for your SolSource!